Blue skies overhead, my buddy Susan and I slip into our scuba gear and shuffle off the beach into the ocean. Divers-down flag in tow, we make the easy five-minute surface swim out to the first reef, just a hundred yards from shore. It&apos;s eight a.m. The locals rolled out of bed just two hours ago. But it&apos;s already bedlam. And still ten minutes before the traffic peaks, and the jam turns to gridlock. Trumpetfish, leaning on their horns. Angry damselfish and sergeant majors, cursing, weaving and cutting in and out of traffic. A four-foot nurse shark dawdling in the fast lane. Bottlenecks of yellowtails and silver grunts. Tie-ups and tangles of neon wrasses. Cleaner fish hustling customers for a wash and wax at the detailing station. Two stoplight parrotfish jockeying for position at the drive-up window, angling for a nip at the coral and a quick take-away. A gang of four-foot tarpon hanging out on the corner, on the down-low. A lone sea turtle, just passing through. Susan touches me on the shoulder, to get my attention. My buddy flashes me an enthusiastic OKAY! signal (looks like ALL-CAPS). I notice that the mask and regulator do a poor job of concealing the eat-a-banana-sideways grin on her face. And I think: "We could be shoveling snow today. Instead, we&apos;re diving Fort Lauderdale. From the beach!" A writer for Scuba Diving magazine once called Fort Lauderdale "an embarrassment of riches." Curious expression. What, exactly, does that mean? An embarrassment of riches is too much of a good thing. Which, for a dive destination, is a high-class problem, isn&apos;t it? 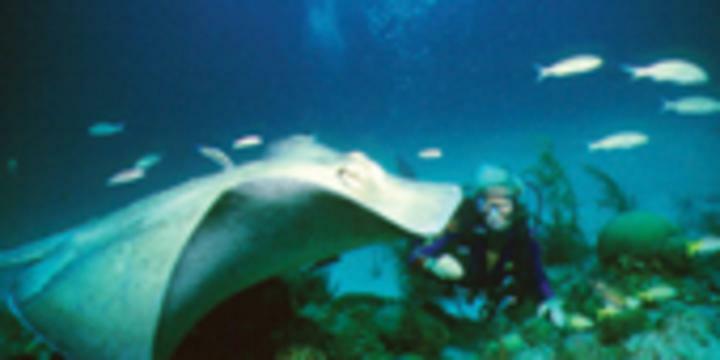 •	top five in the U.S. and North America for big animals and shore diving. How did Fort Lauderdale end up in this embarrassing (but welcome) situation-with too many choices for world-class diving? Blame our predicament on Mother Nature. The source of our blessings is the Gulf Stream, which is, in essence, a river in the ocean. Just off Fort Lauderdale, the Stream swings in close to shore. This river is rich in marine life and nutrients, and it bathes and nourishes the living coral reefs in warm, blue currents. The waters off Greater Fort Lauderdale are a marvel of biodiversity: Mother Ocean decorates the sea bottom with a painter&apos;s palette of colorful hard and soft corals, sea whips and purple fans. The reefs teem with riots of small, colorful tropical fish---hundreds of the same species seen throughout the Caribbean. And divers thrill to encounters with large marine life: sea turtles, nurse sharks, sting rays, barracudas, huge angelfish and giant green morays. In Broward County, three reef lines parallel the 23 miles of golden sand beaches, from Deerfield Beach in the north to Hallandale Beach in the south. On the reefs, structures run the gamut.... from flats, holes, and undercuts... to ledges short and tall, and mini-walls. The first reef begins a hundred yards from shore at its closest. This reef varies from two-foot limestone ledges in ten feet of water, to true coral reefs at 15 to 25 feet. The second starts about a half-mile from shore. Depth ranges from 30 to 50 feet. The third reef lies about a mile offshore; depths run from 60 to 100 feet. The dive sites are close in, no more than a mile from shore. Quick, quick.... hop a dive boat on the Intracoastal, and your captain zips you out the inlet, to the ocean. One-two-three.... 20 to 30 minutes from the dock, you&apos;re drifting down onto a reef or wreck. No long boat rides in Greater Fort Lauderdale. Year round, underwater visibility averages a respectable 30 to 50 feet. But from May to October, divers experience moments of astounding water clarity, when viz ranges from 60 to 100 feet+ on the deeper reefs. Greater Fort Lauderdale is all about endless ways to satisfy your urge to submerge. Whatever your passion for diving, whatever your interest, whatever your skill level, Greater Fort Lauderdale is, year-round, your Number One Destination for total immersion fun.